Larry McMurtry presents a mixed bag of topics here, essays and personal accounts related to his love of books and writing. He uses a cowboy metaphor, stating his life-work is to corral and tame words and drive them forward to a conclusion. Books are his wide open range where he has spent a lifetime roaming. Of more academic substance, McMurtry gives a compelling history of the Texas plains where his family settled and ranched in pioneer days and beyond. It’s also a world he wanted to escape from, going off to urban centers where the supply of books is as abundant as thinking and diversity. So he forsook his father in following a life as rancher and chose to be a bookworm and a novelist. Eventually he came back and and settled. 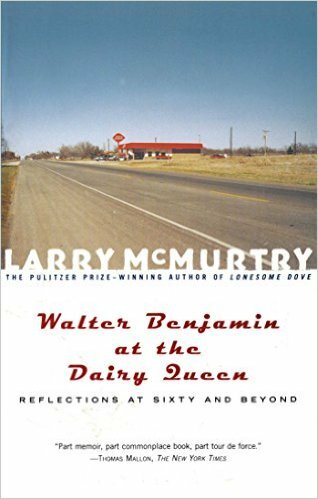 McMurtry validates his subtitle “reflections at sixty and beyond.” He at times is crotchety and nostalgic over times and customs long since lost. It’s a good read, more complex than it first appears. Some patience is required when he wanders off on side roads. One of the better side roads is his account of heart surgery – how surgery and deep anesthesia can change a person. I know several people, including myself, who will vouch for this….something is lost in that suspended time, and its recovery is doubtful. Larry McMurtry fought back to regain his abilities after surgery when he was unable to read. His eventual long dive into the works of Proust and Woolfe reinvigorated the writer in him, a thankful turn for him and all of us who love his writing. Posted in booknotes on April 9, 2016 by Wm P.